1 When they had approached Jerusalem and had come to Bethphage, at the Mount of Olives, then Jesus sent two disciples, 2 saying to them, "Go into the village opposite you, and immediately you will find a donkey tied there and a colt with her; untie them and bring them to Me. 3 "If anyone says anything to you, you shall say, 'The Lord has need of them,' and immediately he will send them." 4 This took place to fulfill what was spoken through the prophet: 5 "SAY TO THE DAUGHTER OF ZION, 'BEHOLD YOUR KING IS COMING TO YOU,GENTLE, AND MOUNTED ON A DONKEY,EVEN ON A COLT, THE FOAL OF A BEAST OF BURDEN.'" 6 The disciples went and did just as Jesus had instructed them, 7 and brought the donkey and the colt, and laid their coats on them; and He sat on the coats. 8 Most of the crowd (E)spread their coats in the road, and others were cutting branches from the trees and spreading them in the road. 9 The crowds going ahead of Him, and those who followed, were shouting, "Hosanna to the Son of David; BLESSED IS HE WHO COMES IN THE NAME OF THE LORD; Hosanna (H)in the highest! We can easily imagine this. The crowd is «moved.» Ones enthusiasm infects the other and soon the atmosphere is so high and hypnotic, that you had to fight hard, to avoid being carried away. In fact, the crowd shouted out a true testimony of Jesus in its great enthusiasm. But who could guess - facing this ocean of «Jesus-enthusiasm» - that Jesus now had started the real countdown to His maltreatment, suffering and death. And that most of the tongues that praised Him to day, a few days later would demand His life - demand Him dead on a cross - the most cruel and disgusting way of execution the Romans could think of in their pagan malice. Who are these people? They are the same people as you read about in the text today. In Matthew chapter 20 (v.17-19) Jesus foretell for the third time His suffering an death. Think of what He must have felt, He who is faithful - is true - is good etc., in His meeting with the falsehood and sins of man. 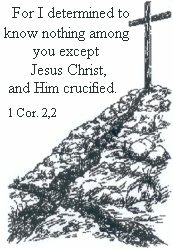 This was an essential part of Jesus‘ sufferings. There are spiritual movements (Christian) who has - and worships - this «Jesus-enthusiasm» as the true foundation to build on and the actual proof of their true life with God. But this enthusiasm changed into the absolute opposite, faster than anyone could imagine. The truth is always revealed where Jesus appears. No one reaches the goal by holding to a form of godliness, but only by the power of God in the Gospel. He came riding on the foal of a beast of burden, and by that He revealed Himself as a servant for those who is able to see. Listen! Your King comes to you, humble, riding... on the foal of a beast of burden. Did you hear that? Your King comes to you as a servant! A servant is a person who is serving someone, and Jesus is much more. He gives Himself to you. This is exactly what you needed to be saved. Jesus could not stop here in this «enthusiasm.» This was not what He wanted. He had to go ahead to Jerusalem to atone. That was His task and desire. He was working for His reward! Yes, in this Jesus was just like all other servants. - He worked for a reward. And what was His profit? That was you - the sinner - who comes to Him. And by all means - never allow yourself to be deceived by the «you are valuable theology» to day. You are not more valuable in your lost condition, than that you would have been lost forever, if He had not paid for your sins with His precious blood. Even if we had no pity with Him in His sufferings, He had pity with us. And is therefore willing to enter into this necessary suffering. Christ had to suffer! (Luke 24:46). A sacrifice which becomes more and more precious and dear to a Christian as he grows in grace and knowledge to Jesus, and not - as somebody preaches - something we leave behind us and go further. It is like you are standing there with (in the believers own eyes) only a poor thanks. But this is not poverty in Gods eyes. It moves the heavens and brings joy to Gods angels. (Luke 15:7 and 10). A lot of «enthusiasm» is not even noticed in heaven, but such a (poor) gratitude caused by knowledge of the truth, is. This is a fruit of Jesus‘ death, and therefore an act of The Holy Spirit. That is the reason why Jesus rides past - not the people - but their enthusiasm, and goes ahead to His suffer, cross and the true crown. Not the crown that the enthusiastic people gave Him, but the crown given by His heavenly Father, for His completed work, and the coronation that happens by saved sinners (poor) thanks! No one, but those it concernes, can understand this. Many is ruled by (religious) feelings - these by the Spirit. It was a big task given by Jesus when He asked these two disciples to go into the village and take the donkey from the owner. It required a strong faith and trust in Jesus. Think of the situation. But Jesus, who knows His owns weakness, He sent something to strengthen their faith along with them: «- and immediately you will find etc.» He predicted what they would meet, and when they did just that - found what He had already told them, and got His word confirmed by that - it gave them frankness to untie them and bring them to Him. Many picture to themselves that faith is a trust created by us, and then we try to «create» a mighty faith, that we believe shall work something. But it is the Word, that creates faith! And the faith that does not have its origin from the Word, is just ones own imagination. What kind of reward shall we (sinners) receive from Him? We who have always «burdened Him with our sins, and wearied Him with our iniquities?» (Is. 43:24). Listen! : «I, even I, am the one who wipes out your transgressions for My own sake, And I will not remember your sins.» (Is. 43:25). And this is only the half of it! «Speak kindly to Jerusalem; And call out to her, that her warfare has ended, That her iniquity has been removed, That she has received of the LORD'S hand Double for all her sins.» (Is. 40:2). Double! Not only has the sin been taken away, but one is also wrapped in the Lords own righteousness. «- but where sin increased, grace abounded all the more.» (Rom. 5:20b). It is mentioned in Is. 62 in connection with the coming of Jesus: «Lo, your salvation comes.» (v.11). In what other way could a mortal man - sold as a slave to sin (Rom.7) - be rescued, if not the salvation comes? Comes to us! Before Jesus‘ second coming - and especially now in the Advent - it is important for us to be aware of this, that what happened with the Jews - will happen in a larger scale when «the apostasy comes.» (2 Thess. 2:3). Through the history there has always been people who rebels against Christianity, but in the last days there will be a common rage against the true Christianity (Christ) all over the so-called Christian part of the world. «The time will come when they will not endure sound doctrine.» (2 Tim. 4:3). To not endure is a very strong expression! But this unwarranted rebellion will only cause that Jesus comes back to earth, to a final judgement over His enemies «who hated Him without a cause» (John 15:25), and a rescue for those who are waiting for Him in these dark days. Here too we see the word from the Scripture fulfilled: «We know that God causes all things to work together for good to those who love God.» (Rom. 8:28). Also the enormous rebellion of His enemies. My soul, why are you grieving then?